The Type 30 was a bayonet designed for the Imperial Japanese Army to be used with the Arisaka Type 30 Rifle and was later used on the Type 38 and Type 99 rifles. Some 8.4 million were produced, and it remained in front-line use from the Russo-Japanese War to the end of World War II. It is a a single-edged sword bayonet with a 400 millimeters (15.75 in) blade and an overall length of 514 millimeters (20.24 in) with a weight of approximately 700 grams. 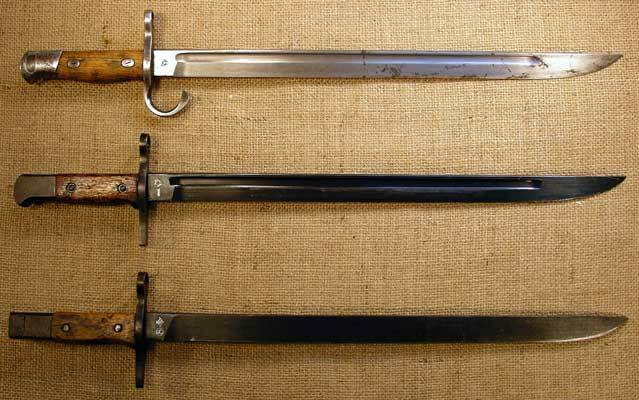 The Type 30 bayonet is also known as the “Pattern 1897 bayonet”. Early Type 30 bayonets usually sported a hooked quillion guard which gave it a distinct look, but later models had a straight hand guard. The design was intended to give the average Japanese infantryman a long enough reach to pierce the abdomen of a cavalryman. However, the design had a number of drawbacks, some caused by the poor quality of forgings used, which tended to rust quickly and not hold an edge, and to break when bent. The weapon was manufactured from 1897 to 1945 at a number of locations, including the Kokura Arsenal, Koishikawa Arsenal (Tokyo) and Nagoya Arsenal, as well as under contract by private manufacturers including Matsushita, Toyoda Automatic Loom and others. The Bayonet was extensively used by Japanese troops to harass Prisoners of War in Internment camps and Civilians during the Japanese occupation of the Philippines. Many died at the point of the bayonet. The blade, almost 16 inches in length is more than enough to pierce through the average human torso. Its use in the Philippines first gained notoriety during the Bataan death march where thousands of captured allied soldiers died. In the final stages of the war during the Battle of Manila, many civilians were bayoneted to death by the Japanese whose crime was being loyal to the Americans. When Japan was defeated, the captured rifles with their bayonets were burned and melted for scrap, and more were dumped in the Pacific Ocean. In the Philippines, few bayonets survived in pristine condition and were snapped up by collectors and World war 2 enthusiasts.